Parkersburg South's Tyee Gibson, left, and Hunter DeLong tackle Parkersburg's Rylan Hamilton during the Patriots' 19-13 double overtime victory over the Big Reds. Photo by Jeff Baughan. PARKERSBURG — When J.T. 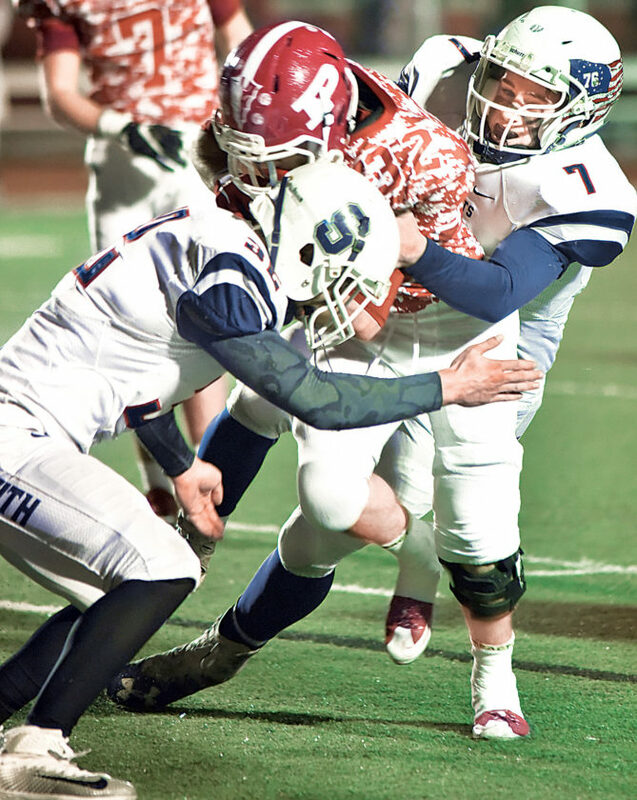 Kemp got rolling in the second half Friday night, there was no stopping the Parkersburg South bulldozer by host Parkersburg High. After Kemp and his teammates were pretty much bottled up by the Big Reds in the first half, they tallied three touchdowns in the final quarter and two overtimes to prevail over No. 20 PHS 19-13 at Stadium Field, but probably didn’t make the Class AAA playoff field. And Kemp provided two of those TDs in overtime after just eight yards in four carries in the first half after PHS (4-6) moved the ball up and down the field in the first half, but were thwarted from scoring by the No. 19 Patriots defense until Easton Martin went two yards to paydirt with only 1:18 left for a 6-0 halftime lead. South, though, got its run game in gear with five minutes to go in the third quarter behind Kemp, who rushed for 151 yards on 18 carries in the second half alone. He led the charge in an 11-play, 65-yard drive — all on the ground — that concluded with Kemp battling his way seven yards into the end zone on the first play of the fourth quarter for a 6-6 tie. But South (5-5) saw Kemp stopped for no gain on a 4th-and-2 play at the PHS 22 with 3:48 remaining in regulation and Patriot quarterback Brandon Hall was sacked on 2nd-and-7 at the South 45 for a six-yard loss as time ran out to set up overtime. In the initial extra session, it was Kemp carrying three straight times from the PHS 20 to the 2. Two plays later from the 1, there was a fumble in a pileup and Kyle Shreeves picked it up behind the pile and took two steps into end zone with Nick Yoho adding the PAT for a 13-6 South lead. PHS wasn’t done just yet, as on 3rd-and-15 from the South 25, QB Bradley Craig found Karson Snyder in stride right down the middle for a 6-point score, followed by Christian Axman’s PAT to send the game into overtime No. 2 tied at 13-all. PHS was first on offense in OT 2, but never got anything going and South took over and needed just five plays to notch the game-winning score — the final four by Kemp. The second one for him in the march was a 17-yard rough-and-tumble run to the PHS 4, and two plays later from the 1, Kemp plowed in for the win. “We just found no rhythm whatsoever in our offense in the first half,” said South head coach Mike Eddy, who with his team coming alive offensively in the second half posted a second straight win over PHS. “But we’re just grinders, that’s what we do, and more times than not that gives us an advantage. And we played such great defense all night.